There has been a historical assumption amongst clinicians that the scapula will heal fine regardless of the amount of deformity. 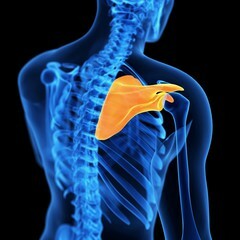 A more defined picture is starting to emerge now that research is focusing on patient-oriented outcomes. Currently, there are reasonably accepted operative guidelines of articular fractures (displaced > than 4mm), process fractures (displaced > 1cm), and glenoid rim lesions associated with humeral subluxation. In addition, recent systematic reviews have identified that there may be a subset of extra-articular fractures associated with poor outcomes when treated non-operatively. There is, however, a lack of consensus in the orthopaedic community regarding specific operative indications for extra-articular fractures. Our surgical criteria for extra-articular fractures is higher than research may suggest accommodating for this lack of consensus. Our surgical thresholds are lowered for unstable double disruptions of the shoulder girdle. Developing a standardized method of measuring and classifying fracture displacement so that there may be a better consensus amongst orthopaedic surgeons is just one example of our research ambitions. 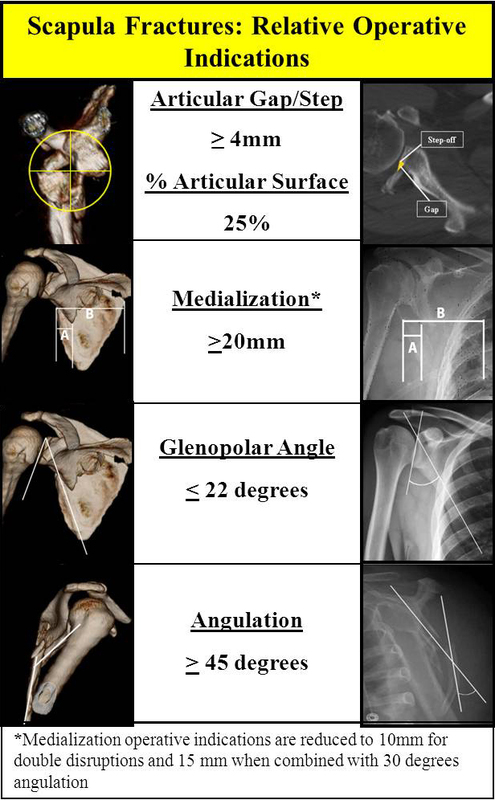 Can the Glenopolar Angle Be Used To Predict Outcome & Treatment Of The Floating Shoulder? There are a number of approaches to ORIF of scapula fractures. The most common approach is the Posterior Judet, which utilizes an incision just inferior to the scapular spine and along the vertebral border of the scapula. Like other fractures, there is a trend to use intermuscular intervals to access the scapular borders for reduction and fixation. An anterior approach at the deltopectoral interval can be used for coracoid and anterior glenoid fractures. Plate and screw placement can be challenging for surgeons less experienced in ORIF of the scapula. This is due to the scapula being very thin in certain regions as well as having vasculature and nerves located very close to common fracture patterns. Finding the optimal approach, optimal implants and identifying vulnerable anatomy is another important area of our research. Delayed operative management of highly displaced scapula fractures is relatively common. Diagnosis can be delayed due to difficulty visualizing the fracture on conventional radiographs. In addition, the prevalence and severity of associated injuries often take priority over scapula fracture management. A recently published paper by our group studied the outcomes of a group of patients who underwent ORIF for a severely displaced scapula fracture in a delayed fashion. The conclusion was that delayed ORIF is technically challenging, but safe surgery can be accomplished with good patient outcomes. We have also looked at operative treatment of patients that have gone on to scapular malunion and found that operative reconstruction can yield good surgical and functional results. We are at the forefront of scapula research. Feel free to contact us about any scapula fracture cases you have questions on.